The prevalence in the community of bacterial resistance to common antibiotic classes has risen dramatically over the past two to three decades. Pathogens can develop antibiotic resistance through many mechanisms. These mechanisms include production of enzymes that degrade the antibiotic (e.g., β-lactamases), modification of drug targets (e.g., modified penicillin-binding proteins and ribosomes that limit the activity of penicillins and macrolides, respectively), and expression of membrane proteins that pump the antibiotic out of the bacteria. TABLE:Mechanisms of Resistance Against Select Antibacterial Classes, 2004 presents the mechanisms by which bacteria become resistant to the various classes of available antibiotics. Alterations in or mutations of the bacterial chromosomes were the first identified mechanisms of resistance, but resistance is more frequently acquired through transfer of genetic material from one bacterium to another. One of the most worrisome mechanisms of resistance involves the ability of bacteria to exclude antimicrobial agents from the cell. Some gram-negative and gram-positive pathogens have an efflux pump that can remove drugs fast enough to protect the bacteria from the drug and its effects. Resistance to an antibiotic may also result from a change or alteration in the target site at which the drug acts. Some strains of bacteria alter the protein composition of their outer cell membrane to prevent a drug from reaching its target site. Metabolic bypass is another common way in which bacteria can become resistant to antibiotics; in this case, the antibiotic interferes with the metabolic pathway by blocking or interfering with a critical step. Some resistant bacteria produce enzymes that cleave or alter the molecular structure of an antibiotic, thereby rendering it ineffective. In vitro susceptibility testing is the basis for classifying bacterial strains as either resistant or sensitive. Most organisms tested in the microbiology laboratory are reported to be either sensitive or resistant on the basis of breakpoints determined by the National Committee for Clinical Laboratory Standards. Susceptibility of strains is reported as sensitive, intermediately sensitive/resistant, or resistant based on the minimal inhibitory concentration (MIC) required by the antibacterial to exert its effect. The clinical relevance of decreased antibiotic susceptibility is controversial. Trials have demonstrated conflicting results with respect to impact on outcome of infection with a resistant pathogen. In many regions, high-dose amoxicillin (3 grams per day) is commonly used to overcome community levels of resistance. 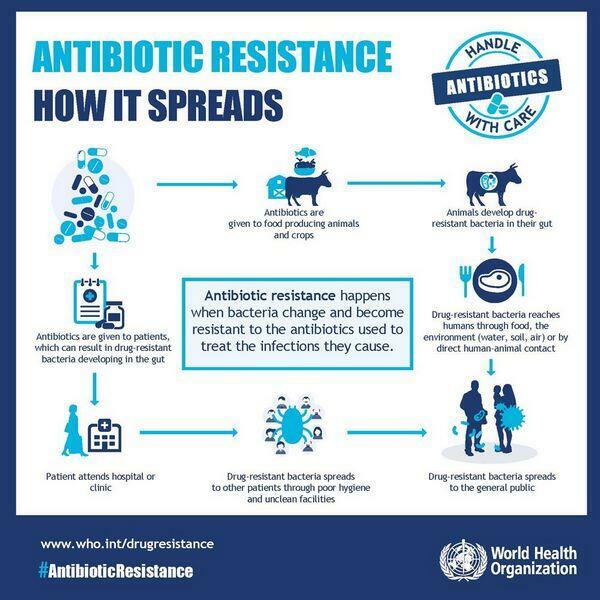 Excessive and routine use of antibiotics has contributed to the increase in antibiotic resistance by selectively encouraging the survival and grow of resistant strains of bacteria. Hospitals and surgeons may promote antibiotic resistance through the routine and sometimes overextended use of prophylactic antibiotics with surgery. Patients contribute to antibiotic resistance when they do not take the drugs according to directions. An insufficient dose of antibiotic usually fails to kill all the disease-causing bacteria. The survivors are the most resistant strains, which may later cause infectious illnesses that are difficult to treat.